Within My Insight, To-Dos presents a summary of the to-do items that have been assigned to you. 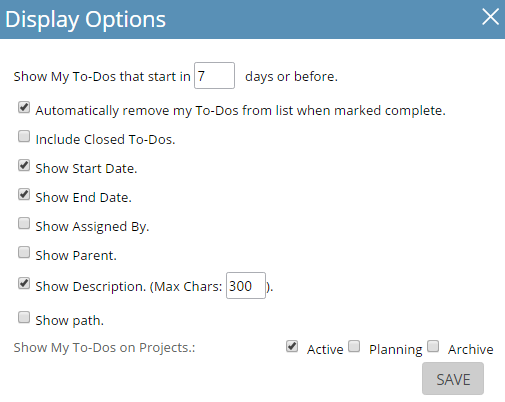 To-Dos differ from tasks in that they are often requests from other team members for assistance, as opposed to official task assignments by a project manager. To-Do items display here based on settings in the Edit Options layer, which is accessed using the Edit Options icon. Apply changes clicking in the lower right of this layer. Another way to filter your display so that only certain To-Dos are shown is to check the Hide boxes at the far right end of the items you wish to hide, then click Hide My Hidden To-Dos. To bring them back, click Show My Hidden To-Dos, then click the boxes for Show or Hide to bring specific items back into your normal view.